After the liberation from National Socialism, the Holocaust of the Sinti and Roma was suppressed from historical memory and from public remembrance for decades. The newly founded Federal Republic of Germany did not engage with or reappraise this genocide, neither at the political nor at the judicial level. On the contrary, most of the former perpetrators were able to pursue a career in the private sector or at public authorities. The few survivors, who were scarred both physically and mentally by the persecution and the concentration camps they had endured, were denied moral and legal recognition as well as a material compensation by the German state. The genocide was ignored not only in politics, society and academia – even at the historical places of persecution, the memorial and commemorative sites, it took a long time to engage with this crime. This was also true for commemorative events at Auschwitz and other places of extermination. 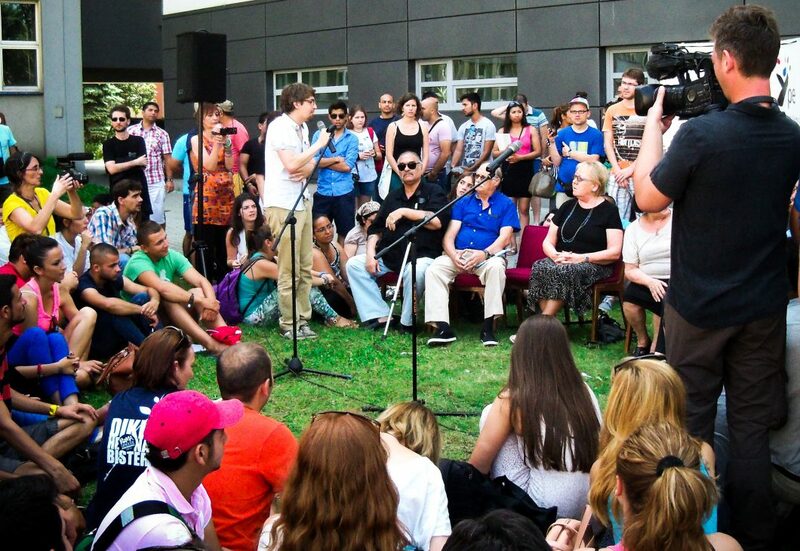 A fundamental change has taken place in the way the genocide of the Sinti and Roma is remembered today. That is mainly due to the civil rights movement of German Sinti and Roma and the work of the Central Council of German Sinti and Roma: In 1982, the Central Council – founded in February of that year – was able to bring about the formal recognition of the genocide by the then Federal Chancellor Helmut Schmidt. The Documentation and Cultural Centre of German Sinti and Roma, a specialised body of the Central Council, was founded in 1997. The Centre hosts the permanent exhibition on the dimension of the Holocaust of the Sinti and Roma; this exhibition was the first to show the general public the scale of the genocide perpetrated against the minority. Representatives of the Heidelberg Centre were also appointed to expert committees in order to advise memorials and assist them in the conceptual and content-related aspects of their work. As a result of this close cooperation, the genocide of the Sinti and Roma is now well documented in many exhibitions at many memorial and commemorative sites. 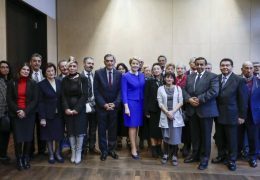 On 24 October 2012, the Federal Government, represented by Federal Chancellor Angela Merkel, inaugurated the Memorial to the Sinti and Roma of Europe Murdered under the National Socialist Regime in Berlin. The fate of the 500,000 Sinti and Roma murdered during the Holocaust was officially honoured, thirty years after the then chancellor Helmut Schmidt had recognised the genocide. 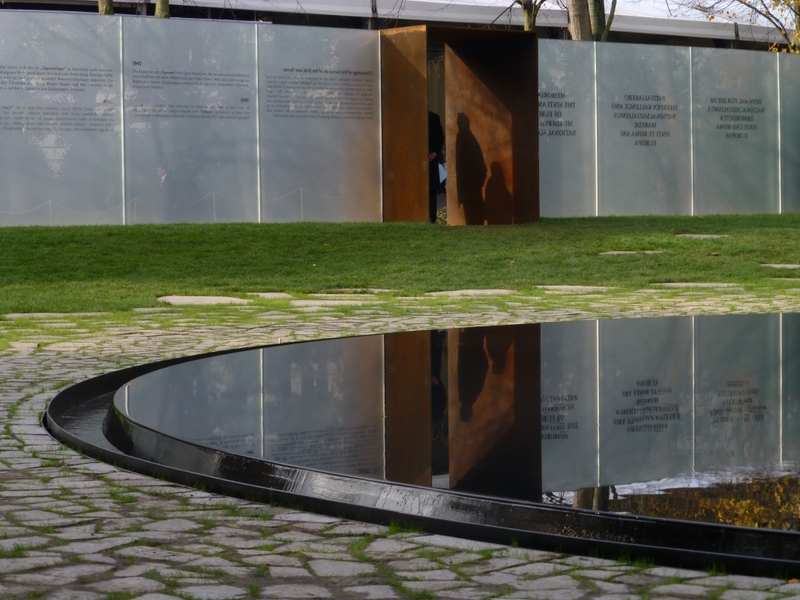 The construction of the memorial is an important achievement of the civil rights movement of German Sinti and Roma and the work of the Central Council, who had campaigned for more than 20 years for the establishment of a central Holocaust memorial in Berlin. The memorial is located in the heart of Berlin, between the Reichstag building and the Brandenburg Gate. The aim of the memorial created by the Israeli architect Dani Karavan is twofold: to keep alive the memory of the genocide of 500,000 Sinti and Roma that has been repressed for decades; and to grant belated recognition to the few remaining Holocaust survivors. At the same time, it is a symbolic commitment of German politics and society to live up to their responsibility towards the 12 million Sinti and Roma living in Europe today. The opening ceremony of the memorial was attended by top national and international political representatives and by over a 100 Holocaust survivors from every part of Europe, among them the Dutch Sinto Zoni Weisz who gave an address on behalf of all the survivors. In the middle of a large round and black water basin 12 meter in diameter, there is a retractable triangular granite stele. This stele represents the black triangle label Sinti and Roma had to wear in concentration camps. Every day, a fresh flower is laid onto the stele – a symbol of the non-existent graves of the murdered people. An excerpt from a poem called “Auschwitz” by the Italian Rom Santino Spinelli winds along the edge of the basin. Stone slabs are embedded in the soil around the memorial – engraved on them are the names of the concentrations camps Sinti and Roma had been deported to. At the entrance to the memorial, there are some glass panels providing information about the Holocaust of the Sinti and Roma. Year after year, the Central Council of German Sinti and Roma invites the Holocaust survivors and their family members to attend the commemorations at the former concentration and extermination camps of Auschwitz and Sachsenhausen. Since many older people cannot afford the journey to the memorial sites, society and politics are called upon to help the victims participate in the commemorations at the former places of their imprisonment. 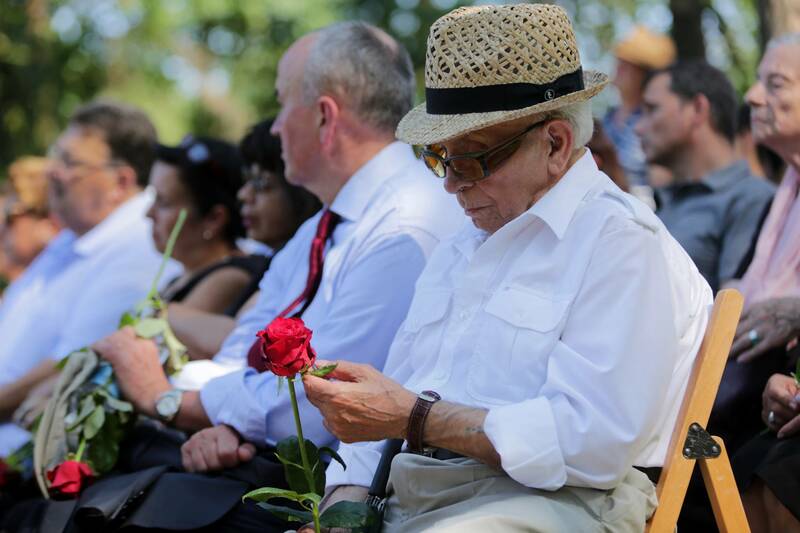 Every year on 2 August, the Central Council of German Sinti and Roma organises a commemoration ceremony at the Auschwitz-Birkenau memorial – in doing so, it keeps alive the memory of the Nazi persecution and murder of the Sinti and Roma. Delegations from Roma associations and Sinti and Roma Holocaust survivors from several countries participate in the act of remembrance. High-level representatives from the Polish government and governments of other countries attend the event regularly as well. In 2011, the Polish Parliament declared the 2 August the national Roma and Sinti Genocide Remembrance Day. 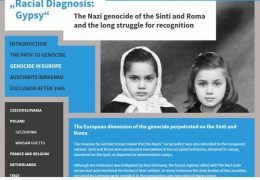 On 15 April 2015, the European Parliament adopted – with an overwhelming majority – a resolution that officially recognises the genocide of more than 500,000 Sinti and Roma perpetrated by the National Socialists and their allies. With this resolution, the European Parliament also declared the 2 August as the European Roma Holocaust Memorial Day. In the early years, the commemorative trips were made possible through the support of the German Federal Foreign Office. Since 2005, the foundation “Stiftung Erinnerung, Verantwortung, Zukunft (EVZ)” (Remembrance, Responsibility, Future) has been backing the trips financially. Between March 1943 and July 1944, the Nazis had deported 23,000 Sinti and Roma from eleven countries in Europe to Auschwitz. Almost all of them died. On 2 August 1944, the remaining 2,900 Sinti and Roma were murdered in Section B II e of the Auschwitz-Birkenau concentration camp on the orders of the Reich Security Main Office (RSHA). A previous attempt to move 6,000 Roma and Sinti to the gas chambers had failed on 16 May 1944 because the prisoners resisted. In the following weeks, SS-doctors classified 3,000 of the prisoners involved in the revolt as still able to work. They were then deported to other concentration camps for slave labour – to Buchenwald, Mauthausen, Ravensbrück, Sachsenhausen and Dachau. 2,900 Roma and Sinti – mainly children, women and old people – remained back in Auschwitz. In the night of 2 to 3 August, the SS brought them to the gas chambers and then burned their corpses in a pit next to the Crematorium V.
Since 2008, the Documentation and Cultural Centre has enabled grandchildren and great grandchildren of the persecuted to engage with the historical site at Auschwitz and to participate in the commemoration ceremony on 2 August. This is part of an educational and commemorative trip. The development of a sustainable concept for such a trip was supported by the union of organisations and initiatives ‘Bündnis für Demokratie und Toleranz’ (Alliance for Democracy and Tolerance). Thanks to this support, over the past years the trip concept has been consolidated and expanded to reflect the experience of the participants. The educational trip includes attending the central commemoration ceremony, meetings with eyewitnesses and seminar sessions; it also gives the participants opportunities to get to know the host country Poland. In 2011, the concept was extended to include members of majority society as participants, and not only Sinti and Roma adolescents and young adults. 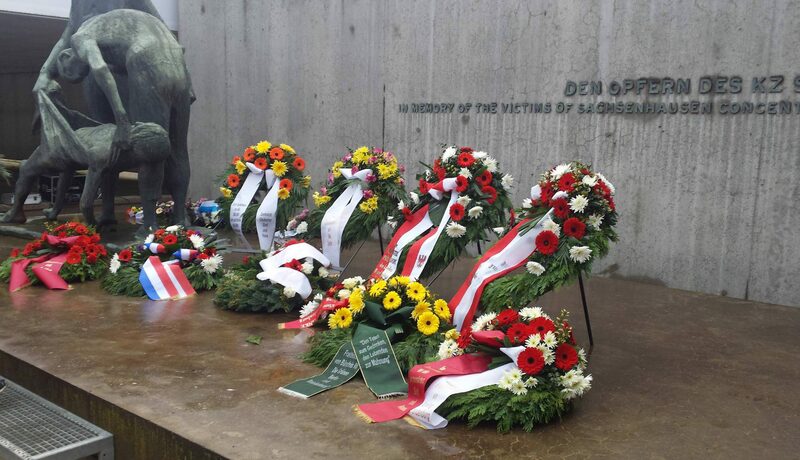 Every December, the Central Council of German Sinti and Roma reminds people of the Sinti and Roma Holocaust victims with a wreath-laying and commemoration ceremony at the Sachsenhausen memorial. The Council regularly invites Holocaust survivors and their family members from all over Germany to participate in the event. 73 years ago, on 16 December 1942, Himmler had signed the “Auschwitz decree”, ordering the deportation of Sinti and Roma from across Europe – among them 10,000 German Sinti and Roma from the then territory of the German Reich – to the Auschwitz concentration camp. Overall, several hundreds of thousands of Sinti and Roma in occupied Europe were murdered in the concentration camps or by the SS task forces. More than 1,000 Sinti and Roma were imprisoned at the Sachsenhausen concentration camp – most of them died there. Since 2004, the Sachsenhausen memorial has dedicated an own exhibition area to fully documenting the history of Nazi-persecution the Sinti and Roma had suffered. Since 1993, an official ceremony to remember the Nazi genocide of 500,00 Sinti and Roma takes place during the last plenary session of the Bundesrat (Federal Council of Germany) on the day of Himmler’s “Auschwitz Decree” of 16 December 1942. 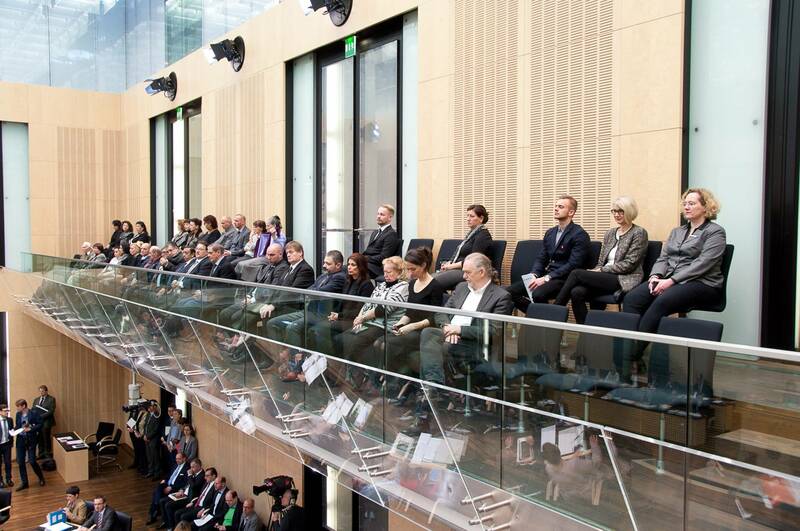 The annual commemoration in the Bundesrat is the result of an initiative of Klaus Wedemeier, the former mayor of Bremen; it has significantly contributed to raising overall political awareness. Every year, the Central Council sends a delegation of Holocaust survivors to participate in the commemoration. Traditionally, discussions between Minister-Presidents of the German states and members of the Holocaust survivor delegation take place on this day. This allows the Central Council and its state associations to discuss important political concerns directly in the Bundesrat. These discussions with the Minister-Presidents have for example played a decisive role in acquiring the consent of all German federal states concerning the signing of the “Framework Convention for the Protection of National Minorities”. The Federal Government signed it on 11 May 1995, recognising with an additional “interpretive statement” that the Sinti and Roma are a national minority with the same rights as the Sorbs, the Danes, and the Frisians.